So my brother was here the other day as I was peering at the weeds in the garden. I explained I was looking for the asparagus. I know it is in there, I saw the tall ferny ends last fall. I was getting impatient. He gamely helped me look, but we could not find any. He also claimed that he really doesn’t like asparagus, but that his wife (who is a smashingly good cook) believes he does. Or at least it keeps turning up on his plate. I must invite them to dinner sometime and try roasted asparagus on him, maybe I can convert him yet. Jump ahead a week or two and we are finding the elusive spears amongst the dandelions and thistles. 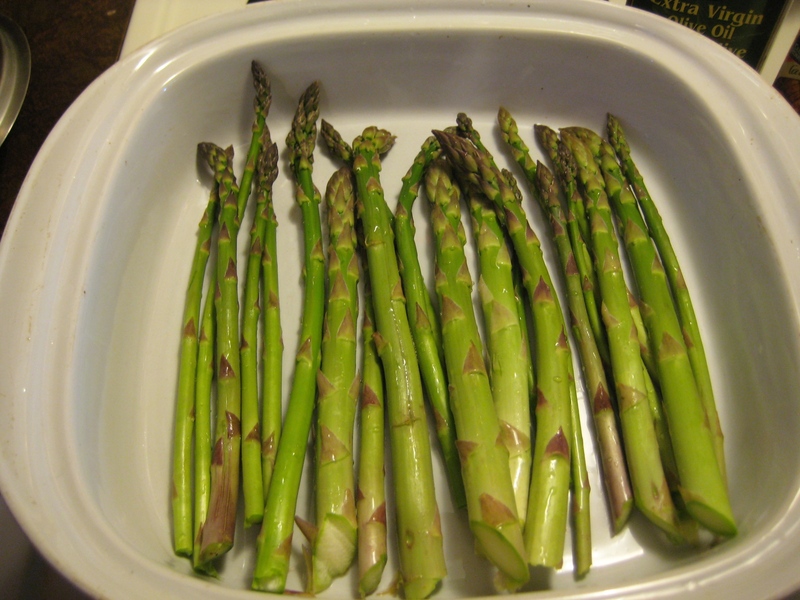 It is a sport for me to head out with my container and sharp knife to hunt the delicious asparagus. It was a good bunch today. 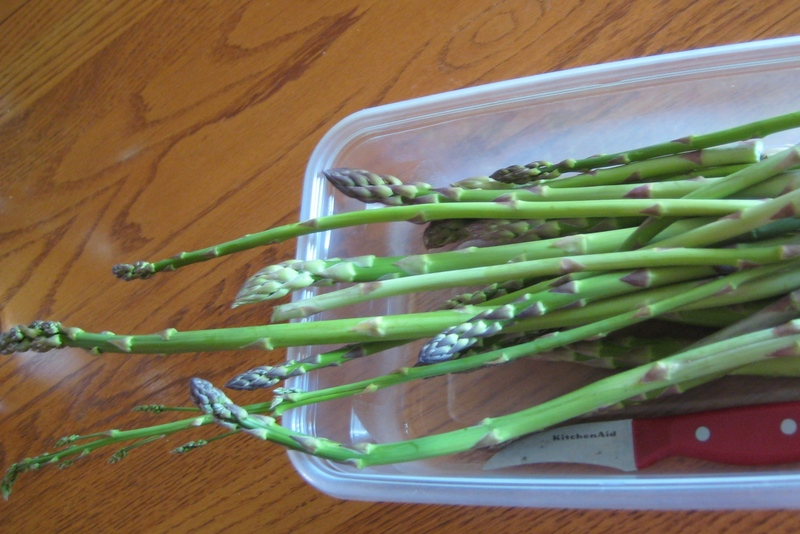 Unlike asparagus from the store it is not all uniform in size or length. I found one today that was almost two feet high! 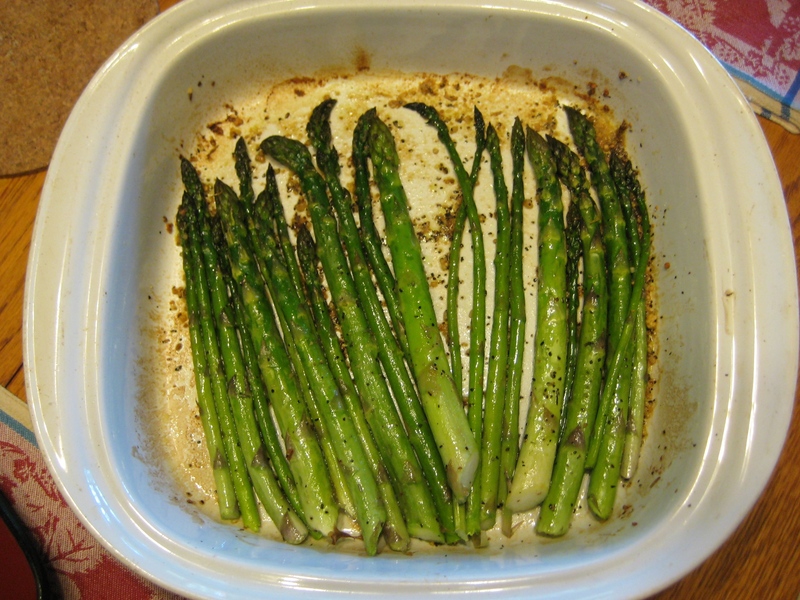 Now maybe you steam your asparagus, or maybe you saute it; but for me roasting is the only way to fly. I pre-heat my oven to about 425 degree farenheit and trim the stalks so the fit into a casserole. You could also do this on a cookie sheet if you had a lot. I drizzle with a little olive oil. And here comes the secret ingredient….. Montreal Steak spice. It is the same spice blend used when making Montreal smoked meats that so many love as a deli meat. The ingredients vary by manufacture but will likely contain some combination of dried garlic, coriander, black pepper, red pepper flakes, dill, and salt. I learned this secret from Miss Murfin’s boyfriend AKA – The Big Newfie. He has worked for a number of years in various restaurant kitchens to put himself through university and he has picked up some serious cooking skills on the way. He made dinner for the family over Christmas holidays. 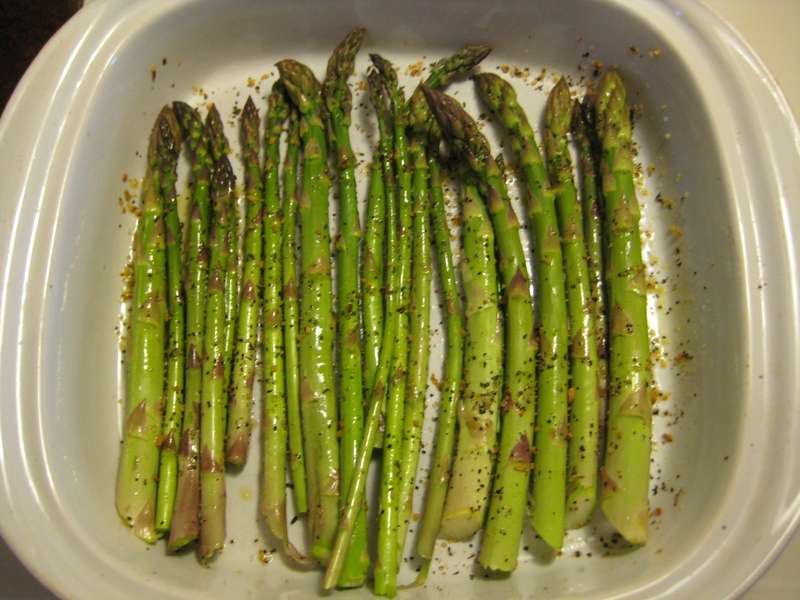 One taste of his roasted asparagus and I was hooked. Five to ten minutes in the hot oven and you have perfection. Unlike steaming, it is hard to over cook it like this. I check on it every couple of minutes, and give it a shake half way through cooking. The thicker stalks are tender and juicy, it hasn’t absorbed any water so it retains all of the gorgeous flavour. The potatoes and chicken seemed dull beside it. mmmmmm we ate the asparagus first. 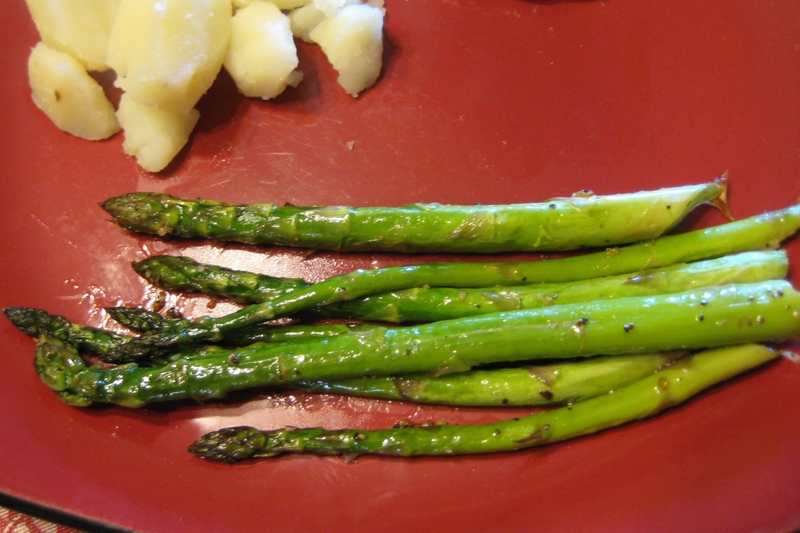 I think soggy boiled asparagus put a lot of people off, but this way is quite different. Asparagus takes years to establish so I was very glad to see it was already here! Yum! That looks and sounds wonderful. Will have to give it a try. I hope you can find Montreal steak spice in your area. Have you seen it there before Robena?